Foundation of the Persian Empire. The founder of the Persian empire. The name is also found in India as "Kurus," and is evidently Aryan. The translation "sun" given by Ctesias (in Müller's edition of Didot's "Herodotus," fragm. 29, 49) is due to a confusion with a Persian word, which appears in Zend as "huare." Persian tradition has surrounded the founder of the empire with many myths. Herodotus, writing about 430 B.C., says (i. 95) that four different stories were current concerning the origin of Cyrus. One of these, to the effect that he was exposed as a child and suckled by a she dog, is rejected by Herodotus (i. 122). It is found, however, in an ancient Greek author (probably Charon of Lampsacus; see Gutschmid, "Kleine Schriften," v. 66), from whom it was borrowed by Dinon, and from the latter again by Trogus Pompeius. This myth, in various forms, is current among many peoples, the most familiar example being the story of Romulus and Remus. It was in all probability narrated of Kai Chosrau, the mythical king, long before Cyrus (Nöldeke, in "Grundriss der Iranischen Philologie," ii. 132 et seq.). The second version which Herodotus examines is the rationalistic transposition of the first; and here the she dog is metamorphosed into a shepherdess of the name of Spako. In Herodotus, another myth, in which Cyrus is the son of a Persian named Cambyses and of Mandane, daughter of the Median king Astyages, is blended with the preceding. In this myth a dream (which Sophocles has embodied in his "Electra," verse 422) foretells that the son of Mandane is to conquer all Asia. The kingship of Cyrus is legalized in this narrative, which makes him the lawful successor of the Median kings. This narrative of Herodotus was controverted about 390 B.C. by Ctesias, who states that Cyrus was not related to Astyages, but that, after dethroning him, he married Astyages' daughter Amytis. This statement is probably correct. Other and purely mythical narratives, probably originating with Ctesias, are contained in the fragments of Dinon (c. 340 B.C.) and of NicolausDamascenus (under Augustus). The story or novel entitled "Cyropædeia," which Xenophon wrote in his old age (after 360), has no value for the historian. 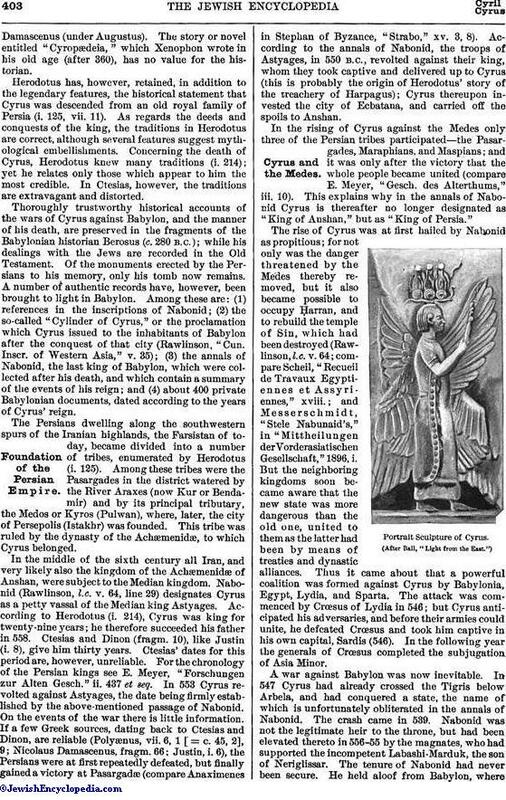 Herodotus has, however, retained, in addition to the legendary features, the historical statement that Cyrus was descended from an old royal family of Persia (i. 125, vii. 11). As regards the deeds and conquests of the king, the traditions in Herodotus are correct, although several features suggest mythological embellishments. Concerning the death of Cyrus, Herodotus knew many traditions (i. 214); yet he relates only those which appear to him the most credible. In Ctesias, however, the traditions are extravagant and distorted. Thoroughly trustworthy historical accounts of the wars of Cyrus against Babylon, and the manner of his death, are preserved in the fragments of the Babylonian historian Berosus (c. 280 B.C. ); while his dealings with the Jews are recorded in the Old Testament. Of the monuments erected by the Persians to his memory, only his tomb now remains. A number of authentic records have, however, been brought to light in Babylon. Among these are: (1) references in the inscriptions of Nabonid; (2) the so-called "Cylinder of Cyrus," or the proclamation which Cyrus issued to the inhabitants of Babylon after the conquest of that city (Rawlinson, "Cun. Inscr. of Western Asia," v. 35), (3) the annals of Nabonid, the last king of Babylon, which were collected after his death, and which contain a summary of the events of his reign; and (4) about 400 private Babylonian documents, dated according to the years. of Cyrus' reign. The Persians dwelling along the southwestern spurs of the Iranian highlands, the Farsistan of today, became divided into a number of tribes, enumerated by Herodotus (i. 125). Among these tribes were the Pasargades in the district watered by the River Araxes (now Kur or Bendamir) and by its principal tributary, the Medos or Kyros (Pulwan), where, later, the city of Persepolis (Istakhr) was founded. This tribe was ruled by the dynasty of the Achæmenidæ, to which Cyrus belonged. In the middle of the sixth century all Iran, and very likely also the kingdom of the Achæmenidæ of Anshan, were subject to the Median kingdom. Nabonid (Rawlinson, l.c. v. 64, line 29) designates Cyrus as a petty vassal of the Median king Astyages. According to Herodotus (i. 214), Cyrus was king for twenty-nine years; he therefore succeeded his father in 558. Ctesias and Dinon (fragm. 10), like Justin (i. 8), give him thirty years. Ctesias' dates for this period are, however, unreliable. For the chronology of the Persian kings see E. Meyer, "Forschungen zur Alten Gesch." ii. 437 et seq. In 553 Cyrus revolted against Astyages, the date being firmly established by the above-mentioned passage of Nabonid. On the events of the war there is little information. If a few Greek sources, dating back to Ctesias and Dinon, are reliable (Polyænus, vii. 6, 1 [ = c. 45, 2], 9; Nicolaus Damascenus, fragm. 66; Justin, i. 6), the Persians were at first repeatedly defeated, but finally gained a victory at Pasargadæ (compare Anaximenes in Stephan of Byzance, "Strabo," xv. 3, 8). According to the annals of Nabonid, the troops of Astyages, in 550 B.C., revolted against their king, whom they took captive and delivered up to Cyrus (this is probably the origin of Herodotus' story of the treachery of Harpagus); Cyrus thereupon invested the city of Ecbatana, and carried off the spoils to Anshan. In the rising of Cyrus against the Medes only three of the Persian tribes participated—the Pasargades, Maraphians, and Maspians; and it was only after the victory that the whole people became united (compare E. Meyer, "Gesch. des Alterthums," iii. 10). This explains why in the annals of Nabonid Cyrus is thereafter no longer designated as "King of Aushan," but as "King of Persia." The rise of Cyrus was at first hailed by Nabonid as propitious; for not only was the danger threatened by the Medes thereby removed, but it also became possible to occupy Harran, and to rebuild the temple of Sin, which had been destroyed (Rawlinson, l.c. v. 64; compare Scheil, "Recueil de Travaux Egyptiennes et Assyriennes," xviii. ; and Messerschmidt, "Stele Nabunaid's," in "Mittheilungen der Vorderasiatisehen Gesellschaft," 1896. i. But the neighboring kingdoms soon became aware that the new state was more dangerous than the old one, united to them as the latter had been by means of treaties and dynastic alliances. Thus it came about that a powerful coalition was formed against Cyrus by Babylonia, Egypt, Lydia, and Sparta. The attack was commenced by Crœsus of Lydia in 546; but Cyrus anticipated his adversaries, and before their armies could unite, he defeated Crœsus and took him captive in his own capital, Sardis (546). In the following year the generals of Crœsus completed the subjugation of Asia Minor. (After Ball, "Light from the East. ")Cyrus Conquers Babylon. A war against Babylon was now inevitable. In 547 Cyrus had already crossed the Tigris below Arbela, and had conquered a state, the name of which is unfortunately obliterated in the annals of Nabonid. The crash came in 539. Nabonid was not the legitimate heir to the throne, but had been elevated thereto in 556-55 by the magnates, who had supported the incompetent Labashi-Marduk, the son of Neriglissar. The tenure of Nabonid had never been secure. He held aloof from Babylon, wherehe did not feel safe, and sought support among the people of the rural towns and their deities, which latter were as a rule much older than Babel and its god Marduk. The jealousy of the cities and of their priests was an important factor in the final catastrophe of the Chaldean empire, and materially facilitated the victory of the Persians. 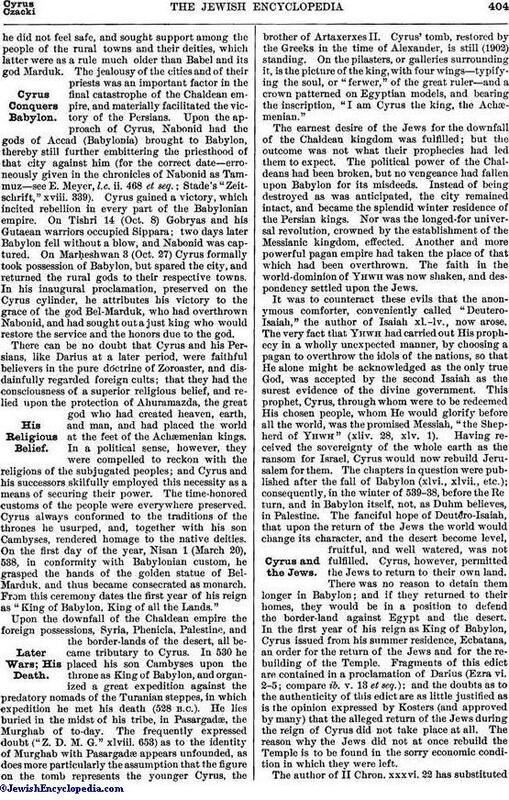 Upon the approach of Cyrus, Nabonid had the gods of Accad (Babylonia) brought to Babylon, thereby still further embittering the priesthood of that city against him (for the correct date—erroneously given in the chronicles of Nabonid as Tammuz—see E. Meyer, l.c. ii. 468 et seq. ; Stade's "Zeitschrift," xviii. 339). Cyrus gained a victory, which incited rebellion in every part of the Babylonian empire. On Tishri 14 (Oct. 8) Gobryas and his Gutaean warriors occupied Sippara; two days later Babylon fell without a blow, and Nabonid was captured. On Marḥeshwan 3 (Oct. 27) Cyrus formally took possession of Babylon, but spared the city, and returned the rural gods to their respective towns. In his inaugural proclamation, preserved on the Cyrus cylinder, he attributes his victory to the grace of the god Bel-Marduk, who had overthrown Nabonid, and had sought out a just king who would restore the service and the honors due to the god. There can be no doubt that Cyrus and his Persians, like Darius at a later period, were faithful believers in the pure doctrine of Zoroaster, and disdainfully regarded foreign cults; that they had the consciousness of a superior religious belief, and relied upon the protection of Ahuramazda, the great god who had created heaven, earth, and man, and had placed the world at the feet of the Achæmenian kings. In a political sense, however, they were compelled to reckon with the religions of the subjugated peoples; and Cyrus and his successors skilfully employed this necessity as a means of securing their power. The time-honored customs of the people were everywhere preserved. Cyrus always conformed to the traditions of the thrones he usurped, and, together with his son Cambyses, rendered homage to the native deities. On the first day of the year, Nisan 1 (March 20), 538, in conformity with Babylonian custom, he grasped the hands of the golden statue of Bel-Marduk, and thus became consecrated as monarch. From this ceremony dates the first year of his reign as "King of Babylon, King of all the Lands." Upon the downfall of the Chaldean empire the foreign possessions, Syria, Phenicia, Palestine, and the border-lands of the desert, all became tributary to Cyrus. In 530 he placed his son Cambyses upon the throne as King of Babylon, and organized a great expedition against the predatory nomads of the Turanian steppes, in which expedition he met his death (528 B.C.). He lies buried in the midst of his tribe, in Pasargadæ, the Murghab of to-day. The frequently expressed doubt ("Z. D. M. G." xlviii. 653) as to the identity of Murghab with Pasargadæ appears unfounded, as does more particularly the assumption that the figure on the tomb represents the younger Cyrus, the brother of Artaxerxes II. Cyrus' tomb, restored by the Greeks in the time of Alexander, is still (1902) standing. On the pilasters, or galleries surrounding it, is the picture of the king, with four wings—typifying the soul, or "ferwer," of the great ruler—and a crown patterned on Egyptian models, and bearing the inscription, "I am Cyrus the king, the Achæmenian." The earnest desire of the Jews for the downfall of the Chaldean kingdom was fulfilled; but the outcome was not what their prophecies had led them to expect. The political power of the Chaldeans had been broken, but no vengeance had fallen upon Babylon for its misdeeds. Instead of being destroyed as was anticipated, the city remained intact, and became the splendid winter residence of the Persian kings. Nor was the longed-for universal revolution, crowned by the establishment of the Messianic kingdom, effected. Another and more powerful pagan empire had taken the place of that which had been overthrown. The faith in the world-dominion of Yhwh was now shaken, and despondency settled upon the Jews. It was to counteract these evils that the anonymous comforter, conveniently called "Deutero-Isaiah," the author of Isaiah xl.-lv., now arose. The very fact that Yhwh had carried out His prophecy in a wholly unexpected manner, by choosing a pagan to overthrow the idols of the nations, so that He alone might be acknowledged as the only true God, was accepted by the second Isaiah as the surest evidence of the divine government. This prophet, Cyrus, through whom were to be redeemed His chosen people, whom He would glorify before all the world, was the promised Messiah, "the Shepherd of Yhwh" (xliv. 28, xlv. 1). Having received the sovereignty of the whole earth as the ransom for Israel, Cyrus would now rebuild Jerusalem for them. The chapters in question were published after the fall of Babylon (xlvi., xlvii., etc. ); consequently, in the winter of 539-38, before the Return, and in Babylon itself, not, as Duhm believes in Palestine. The fanciful hope of Deutero-Isaiah, that upon the return of the Jews the world would change its character, and the desert become level, fruitful, and well watered, was not fulfilled. 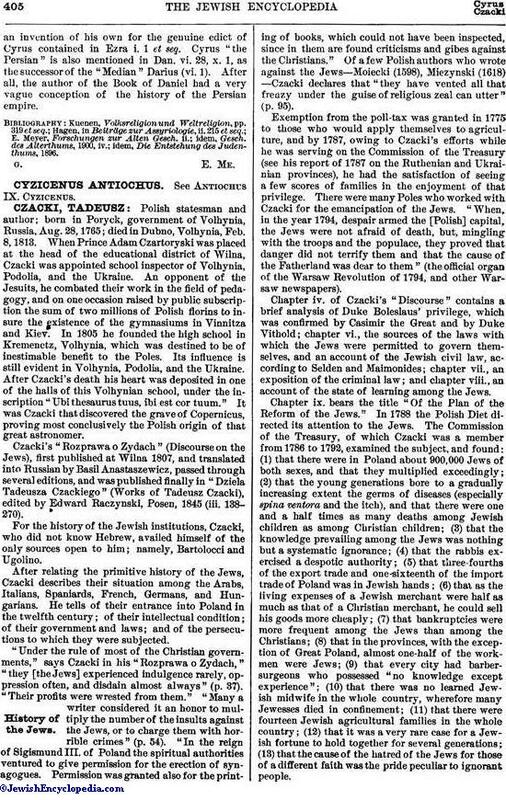 Cyrus, however, permitted the Jews to return to their own land. There was no reason to detain them longer in Babylon; and if they returned to their homes, they would be in a position to defend the border-land against Egypt and the desert. In the first year of his reign as King of Babylon, Cyrus issued from his summer residence, Ecbatana, an order for the return of the Jews and for the rebuilding of the Temple. Fragments of this edict are contained in a proclamation of Darius (Ezra vi. 2-5; compare ib. v. 13 et seq. ); and the doubts as to the authenticity of this edict are as little justified as is the opinion expressed by Kosters (and approved by many) that the alleged return of the Jews during the reign of Cyrus did not take place at all. The reason why the Jews did not at once rebuild the Temple is to be found in the sorry economic condition in which they were left. The author of II Chron. xxxvi. 22 has substitutedan invention of his own for the genuine edict of Cyrus contained in Ezra i. 1 et seq. 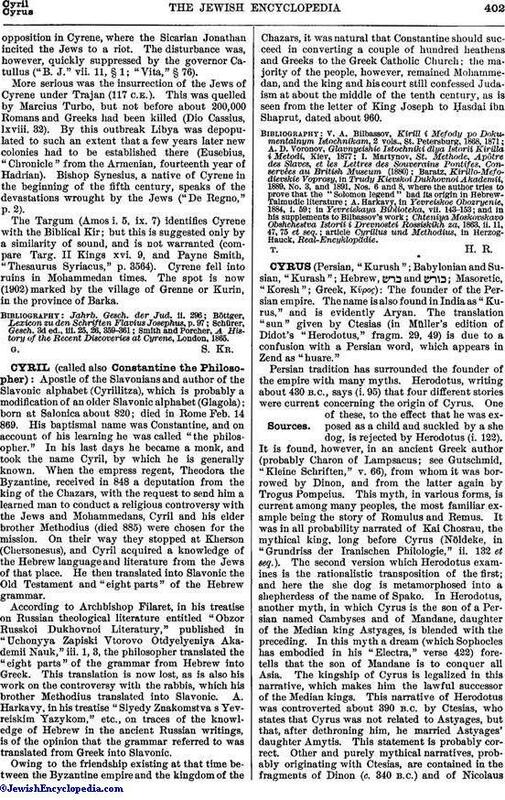 Cyrus "the Persian" is also mentioned in Dan. vi. 28, x. 1, as the successor of the "Median " Darius (vi. 1). After all, the author of the Book of Daniel had a very vague conception of the history of the Persian empire. idem, Die Entstehung des Judenthums, 1896.